This information was last updated on Sunday, May 8th, 2016 at 7:45 pm by . 2011 Audi RS3 Sportback - More than a mere grocery-getter, the RS3 Sportback marries performance with practicality. The result is a 340-horsepower grin-generator that will paste your head to the back of the seat and not crack a single egg in the process. 2012 Aston Martin Vanquish - As comfortable on the track as it is on cozy country lanes, the Aston Martin Vanquish is equal parts refined style and snarling, road-taming grit. 2013 Ford M Shelby Mustang GT500 - While the GT500's aggressive lines suggest raw power and straight-line speed to spare, the sound of that big 5.8-liter V8 simply screams, "Get out of the way!" 2013 McLaren P1 - The successor to McLaren's legendary F1, the McLaren P1 is an automotive highlight reel: technological innovation, gorgeous contours, and pure, unapologetic performance. Epic, legendary, astounding - words tend to fail when describing this car's limitless potential. 2013 SRT Viper GTS - The return of the Viper has been celebrated by automotive fans worldwide. With an 8.4-liter V10 that's capable of pushing the GTS to a top speed north of 200 mph, the 2013 Viper GTS has once again firmly entrenched its spot near the top of the American Muscle hierarchy. 1965 Shelby Cobra 427 S/C - Marketed as "the fastest streetcar in the world," the 427 S/C is the most desirable of all the Shelby Cobra variants. Out of the 100 that were planned only 53 were built. They are nothing less than a purpose-built race car converted at the last minute for street use. 1987 RUF CTR Yellowbird - Dubbed the "Yellowbird" by journalists during a test drive event, the 1987 RUF CTR Yellowbird earns its name thanks to the canary-like chirping of its twin turbo blow-off valve. Just 29 of these cherished classics were built. 1991 Mazda #55 787B - One of the most beloved race cars of all time, the 787B holds the distinction as being Japan's only winner of a 24 Hours of Le Mans race. Featuring a brash green and orange livery and an unmistakable screaming Wankel rotary engine, the 787B continues to inspire more than 20 years after its debut. 2011 Ford F150 SVT Raptor - Say hello to your rear view mirror's worst nightmare. The Raptor is essentially a factory-built pre-runner race truck with suspension to match its under-the-hood muscle. Slide it, jump it, whatever you like - it just begs for more. 2011 Bugatti Veyron Super Sport - Even among hypercars, the Veyron Super Sport stands alone. After all, this is the car that currently holds the Guinness record for "World's Fastest Car" at speeds approaching 270 mph. Day One Car Pack - A three-car pack featuring special liveries and custom tuned cars. See below for details on the Day One Car Pack. 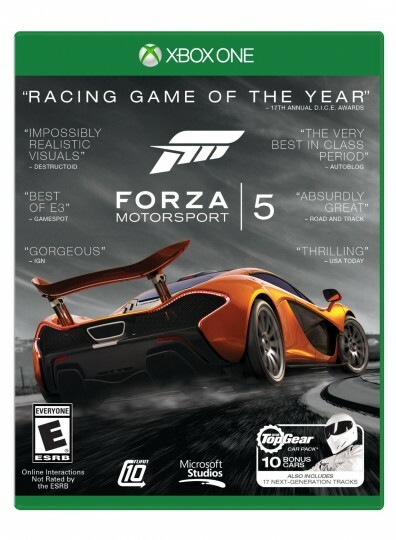 In addition, "Forza Motorsport 5" Limited Edition owners will receive a custom Steelbook case, a decal sheet featuring "Forza Motorsport 5", "Xbox One", and Audi window decals, and 1,250 car tokens (a $9.99 value) that will allow Limited Edition owners instant access to any car in the game. The "Forza Motorsport 5" Limited Edition will be available for an estimated retail price of $79.99 at launch and is now available for pre-order at participating retailers. "Forza Motorsport 5" fans will also have the option to pre-order the "Forza Motorsport 5" Day One Edition, featuring the Day One Car Pack and special Day One commemorative packaging with artwork that matches the Xbox One Day One console design. 2010 Audi TT RS Coupe - Stuffed stem to stern with modern tech, the TT RS is the first TT model to carry Audi's famed RS badge - a distinction that's earned on the track from the moment you step on the gas. 2011 Lamborghini Gallardo LP570-4 Superleggera - Like great sculpture, the Superleggera's chiseled form is carefully considered for maximum impact. That's where the similarities end, however, because this work of art is best appreciated when it's moving at top speed. The Day One edition of "Forza Motorsport 5" will be available for an estimated retail price $59.99 at launch and is now available for pre-order at participating retailers. "Forza Motorsport 5" will be playable at this year's Gamescom conference in Cologne, Germany. Conference attendees will be able to play an updated build of the game, as well as check out the "Forza Motorsport 5 Limited Edition" cover car - the Audi RS7 Sportback - on display in the Xbox booth throughout the week. Was gonna get Forza 5 on launch anyway, so that's nice. "the Day One Edition games feature collectible box art and exclusive in-game content that will unlock unique items and experiences. Available while supplies last. This offer will be extended to all existing pre-orders"
Or is this all the same with a different name. is that you unboxing mike? Very nice. ^o^ Still toying with the idea of getting this, but with the cost of the console already and the games being 10 quid more than current gen titles, not sure I could justify it, especially with it not coming with the game. Nice edition though. Will see how funds are looking.